HÀ NỘI — Japanese netted melon, a nutritious fruit with a seductive flavour, has been successfully and profitably grown in Việt Nam thanks to the application of high-tech cultivation methods. Recently, at the Hà Nam Hi-tech Agriculture Zone in northern Hà Nam Province, the Việt Nam National Seeds Joint Stock Company (Vinaseed) successfully planted the fruit. “Hà Nam Hi-tech Park, with an area of ​​21.59 hectares, possesses one of the most modern cultivation infrastructures in the country. Using a specialised hot house with sun-proof roof, automatic irrigation, a water treatment system and processing and packing technology, the park is fully qualified to grow the specialty," said Đỗ Bá Vọng, deputy director of Vinaseed, told Government portal chinhphu.vn. Japanese netted melon is rich in vitamins A and C and contains anti-oxidants and elements that help fight osteoporosis and cancer, Vọng said. But he added that the fruit was hard to grow in the open as its skin cracked easily, enabling it be penetrated by bacteria and fungus. Fruit quality totally depends on temperature, light, humidity and irrigation, so it needs to be grown in modern hot houses using high technology. Netted melons grown in Hà Nam Hi-Tech Park are round and weigh from 1.5 to 1.8kg each. They are crisp and sweet. Vũ Văn Vương, deputy director of Hà Nam High-tech Park claimed that the fruit grown at the park was the same quality as in Japan, but fetched only one-tenth of the prices of melons imported from Japan. “Melons are being produced all year round, meeting the demands of the domestic market and others in Europe and the US,” Vương said. According to Tasima Hisashi from the Japan International Co-operation Agency (JICA) in HCM City, high-tech agriculture can help enterprises and co-operatives increase productivity by 30 per cent. He said the core purpose of high-tech applications was to produce quality products in large quantities to make the highest profits. 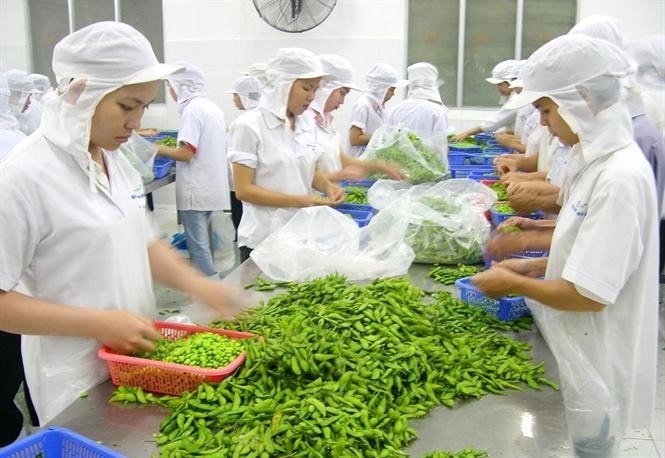 Regarding the vegetable and fruits industry in general, the Minister of Agriculture and Rural Development, Nguyễn Xuân Cường, said that the industry had great development potential. In the Government’s agricultural restructure scheme, vegetables and fruit were identified as key agricultural products for export. Currently, the global annual demand for fruit and vegetables is about US$650 billion, which indicates a great opportunity for Việt Nam. The minister proposed the Government adopt policies to remove difficulties in land, credit and science technology to support enterprises expand and accelerate hi-tech applications for farming.